Here is my first match in the new edition. 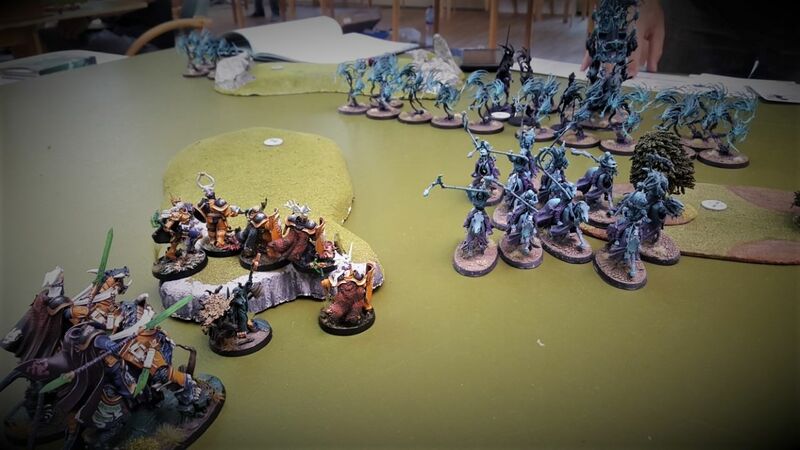 Up against Nighthaunt no less! Matched play, 2k, no assigned realm, playing "Better Part of Valour" battleplan. The Nighthaunt opponent. 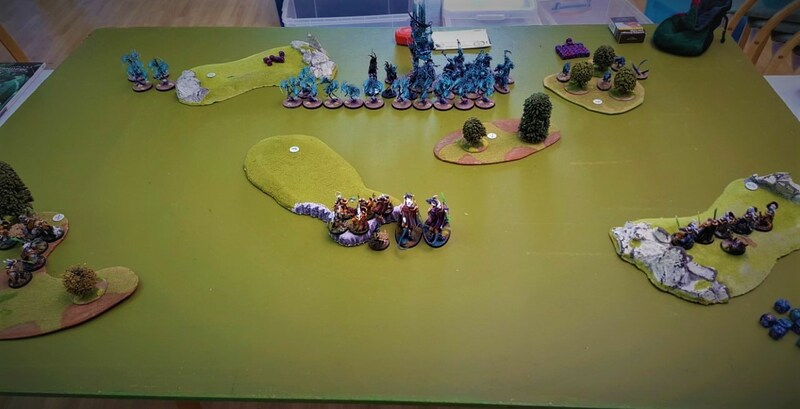 A Small x3 spirit host unit is located on the far left flank, and a further 5 man Hexwraith unit is on the far right. Deployment takes place. 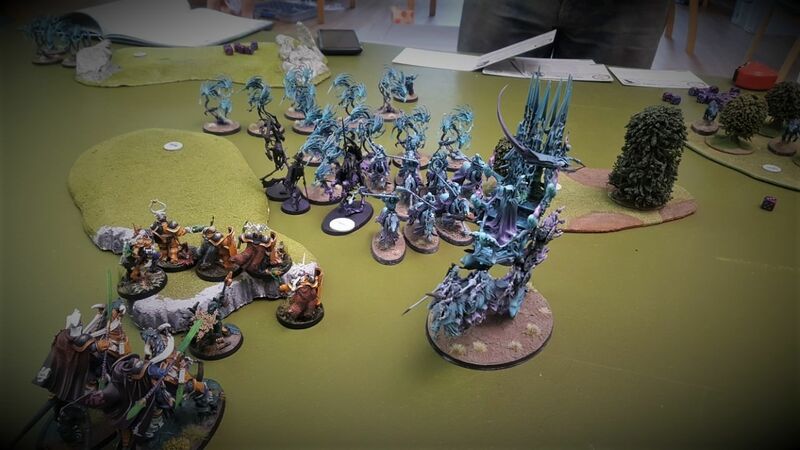 Nighthaunt decides to take the first turn, made very easily by only having 3 drops thanks to two battalions and taking an extra CP! - We had discussed mid deployment that he would give me the first turn, but as that changed I did alter my deployment in the center slightly. Liberators, wishing they were Sequitors right now. Devastating for my center! - My opponent also decides to burn his 3 home objectives, due to my reserves potential! Was not expecting that at all. 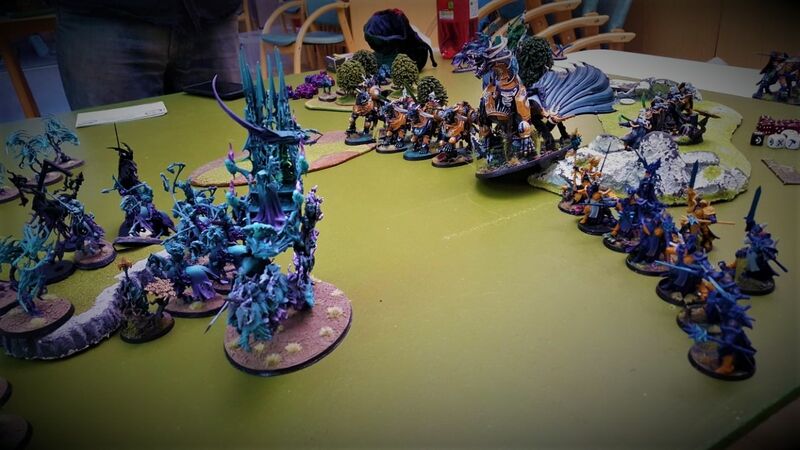 Its now 3 VP to 0 in Nighthaunt's favour at the end of his turn 1. And fail all of their charges, including the re-rolls. That 9" charge is not making me feel too comfortable about now! The Dracoth's receive the Hexwraith charge! Delighted they're atleast -1 to hit! 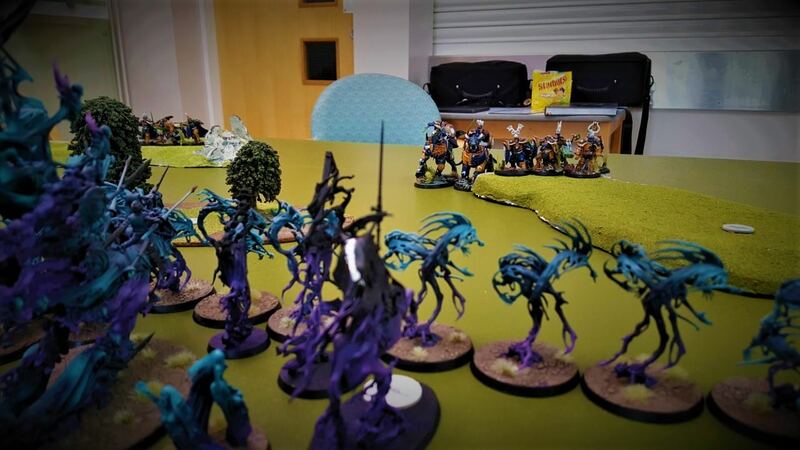 Most of the Nighthaunt at this stage bounce off, although the Drakesworn does take 6 damage. My turn two and I use the Celestial Vindicator +1 attack CP on the Evocators and they obliterate what was a proxied Black Coach & Hero. Before even making their MW rolls! Before this happens though, spirit hosts from the center charge against my far left Liberators, and the smaller x3 spirit host is setup 9" away from my back right objective. Both Protected by 5man liberators squads. One of which is in Mystical terrain on my right. The charge goes well and both units make it it. Doing enough MW's to the far left Liberators that the objective is immediately burned down. 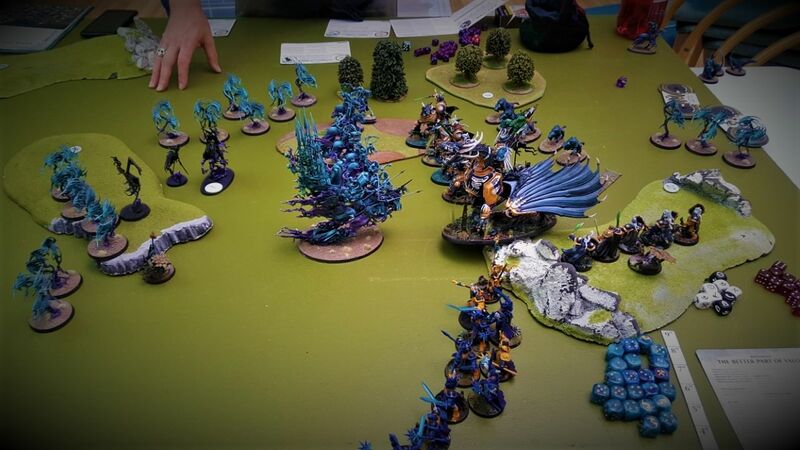 Whilst the charge is made by the smaller spirit hosts into my right flank, and by the supporting Hexwraiths. The middle objective is also burnt, before my turn two charge. 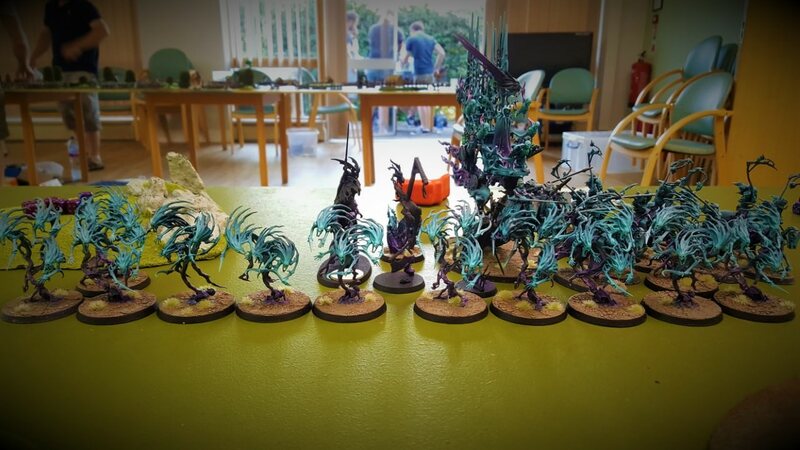 Taking Nighthaunt to 5 VPs to my 0. Things start to look really grim, when I now only have the last remaining objective on the table, and its only just out of contention by one model! A new spirit host unit is setup ready to charge though! Luckily for me, it does not make its 9". Still in the game... just! From this point onwards, it was now really mopping up for me. 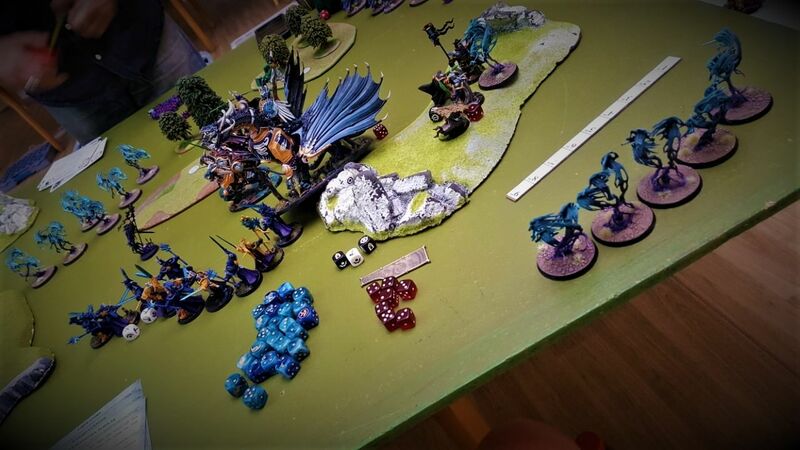 I charges the Drakesworn into the spirit hosts to delay them, and everything else into whatever was left in the middle of the table. The damage output of x4 Dracoths and x10 Evocators with +1 attack is simply brutal. All whilst my rend was negated aswell! The Drakesworn does go down by mortal wounds, but he had done his job and kept the Nighthaunt there. I win turn 4 priority and make the charge with my Dracoth cavalry to wipe the remaining spirit hosts. Giving me a very tight victory of 8VPs to 5 VPs due to holding the one objective consecutively for what would have been 5 turns, and wiping the enemy from the table. Really enjoyed the game. Really felt the difference with the new priority roles. I had two times when we both rolled the same, and lost out for two double turns so I suppose that balances things in a way. Could really have done with them though! Compelling game, thanks for posting. Always nice to get a chance to profit from someone else's usage of units I'm interested in fielding. Yeah I understand totally what you mean there. Always handy to get to grips with these things, especially before you buy or start to commit paint to them as well! Is your list similar, and using the same stormhost, or just select units? I'm using similar units for the most part. 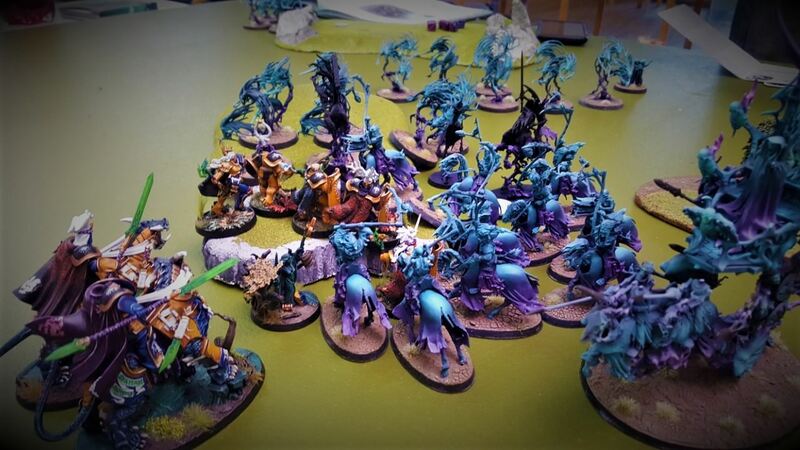 I haven't quite been sold on the Stormhosts (I just don't like being tied down to all the abilities when I generally only want one or two of them). I had a lot of success with the Star Drake in 1.0 - haven't played much with him yet (been trying out the new toys) but its good to see he's still a viable large centerpiece along with the fulminators. 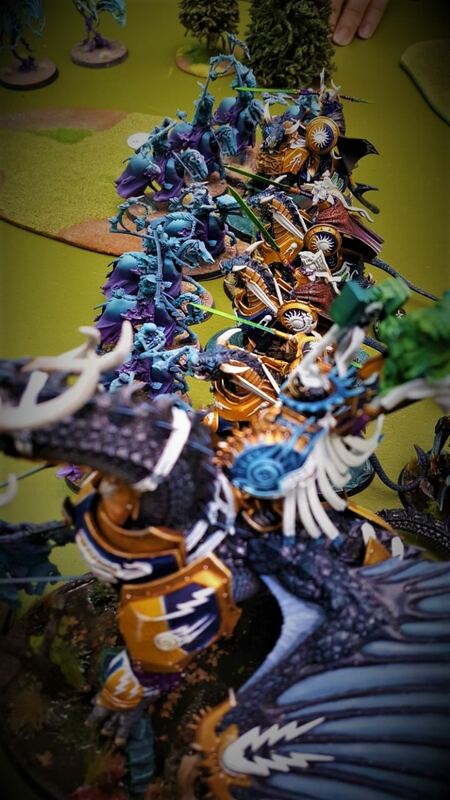 I used to run with the Lord Celestant on Stardrake, but I've actually dropped to the Drakesworn Templar. Specifically to target Monsters and go all out. Think Archaon. 3s to hit rr 1's on charge. 3s to wound. Dmg 2. Any unmodified 6 to hit that targets a MONSTER inflicts D6+1 mortal wound no wound or save rolls allowed. 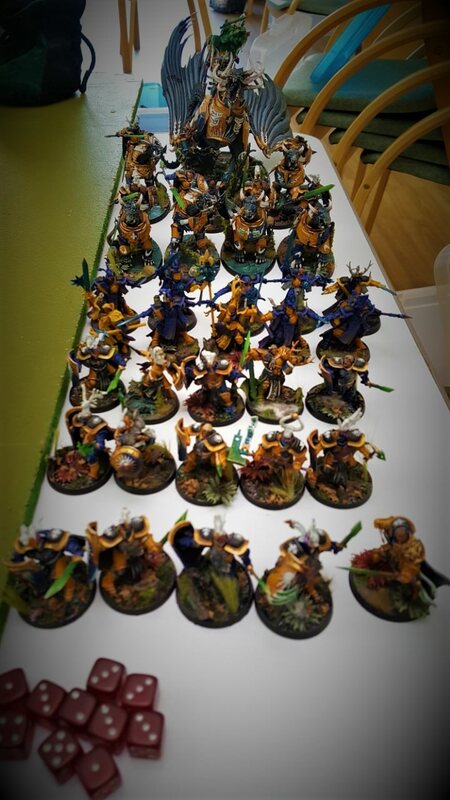 I gave the Templar a shot this weekend (in a fairly odd overall list) and was very impressed. Going to give him a few more shots but I think he's a great contender in the slot. 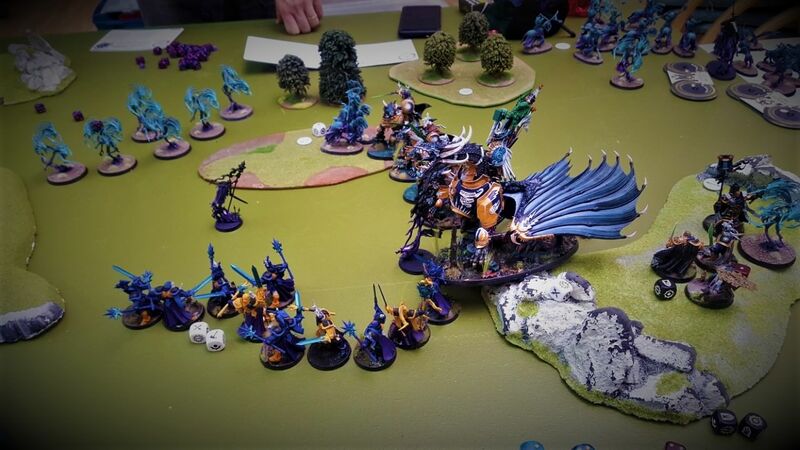 Looking at this battle plan the nighthaunt player took a massive risk (and it did not even pay off). Had you won round 1-2 double you could have simply ended turn and burned your objectives to win automatically. You literally had a 1/3 chance of winning outright top of round 2! Regardless I think you were wise to play it the way you did, though I would note that by having the objective campers make a line with the back edge of their bases in the 6" contest zone you can make it so enemies which charge them are still out. 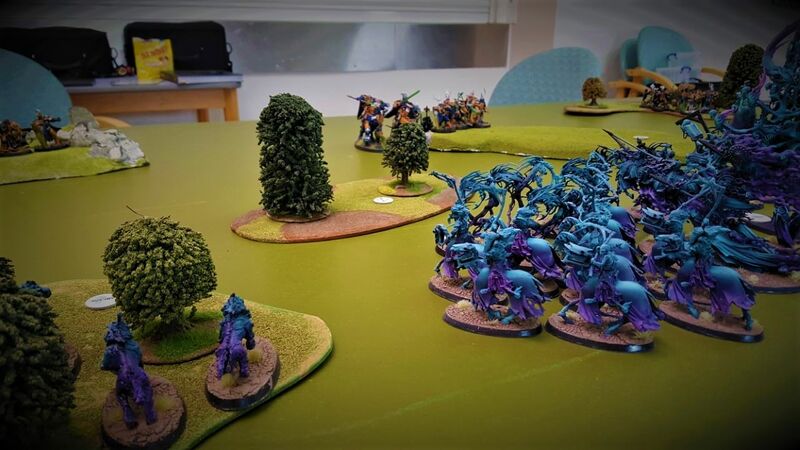 In this case it would mean the liberators 'facing' the back edge of the board meaning that if the spirit hosts even had room to come in on the other side they would be sandwiched between the objective campers and the center forces. Also it may seem small but both armies have dice that match their paint job and this pleases me greatly. I am looking to build out my Nighthaunt (and Stormcast) so this was a great read! Your opponent has a Mortis Engine - was that a proxy for a Black Coach or something?